As acute trusts come under increasing pressure in the past few months, staff effort in helping maintain coverage and response rates for the NHS Friends and Family Test may have been diverted. 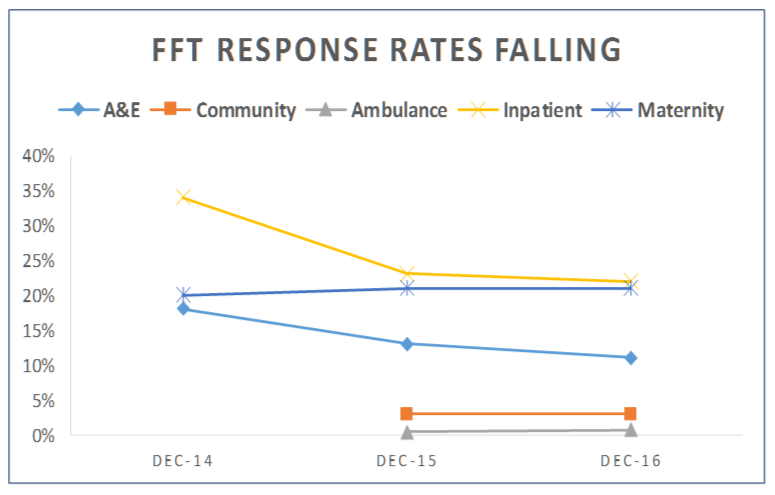 The most recent figures from NHS England show that in December, the response rate for A&E has reduced to an average of just 11% and for inpatients has reduced to 22% of those eligible to respond nationally. A lower coverage and response rate means the data is less representative of all patient groups and less useful. A lower coverage and response rate means the data is less representative of all patient groups and less useful. To improve response rates with no staff effort means using a fully managed experience measurement service such as that provided by CoMetrica which can mean zero staff effort and 100% coverage of all patients. CoMetrica can contact patients on your behalf, systematically measuring not only FFT but all other aspects of your service with questions automatically matched to individual services and patient groups. To find out how we can help you, click here.